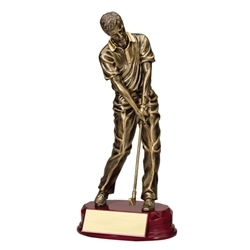 Male Golf Bronze Series Chip Shot Trophies are made of resin and come in three different sizes starting at 7.5" so they are great for tournament prizes. These golf trophies really score!!! Item Size 7.5", 9.75", or 11"